Shine in a suit or tux that fits you perfectly! Whether it’s a rental for that special night or a suit you can wear again and again, we have something for you. We can help you match a dress or other suits, but give you your own style! Slim & Ultra Slim sizes are available! Come in early for the best selection! Add shoes for only $15! We hem the pants and press the suit and shirt. View the catalog for our selection of prom suit styles, colors, and accessory colors. 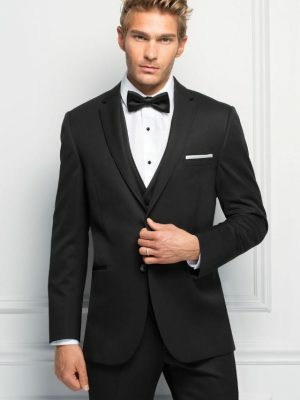 The two buttons below will take you to our distributor’s website, but be sure to stop in our store to schedule a measuring and reserve your suit or tux.